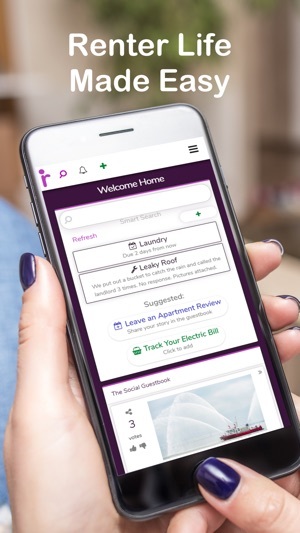 Get the #1 social app just for renters! 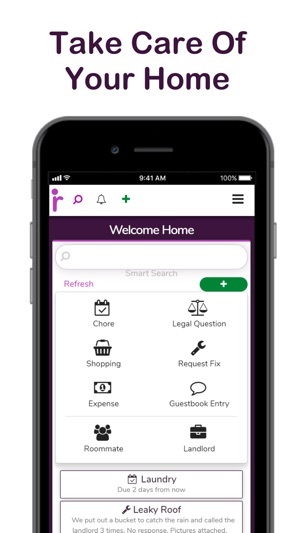 Selected as "Best of" legal apps, use RenterPeace to learn your rights, stay updated on neighborhood news, determine which roommate needs to do the dishes, get reminded to pay your cable bill, share your renter story in the guestbook, and more. Just tell the smart assistant what you need help with. Try it without creating an account! 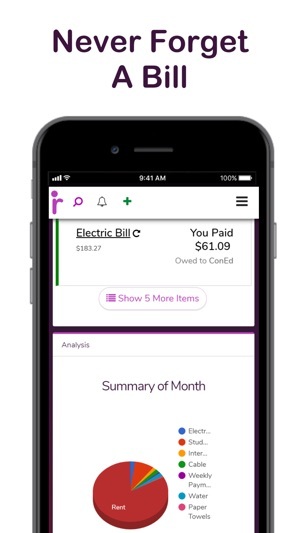 ► Document your problems and notify your landlord. ► Write reviews of your landlord and other stories in the guestbook. 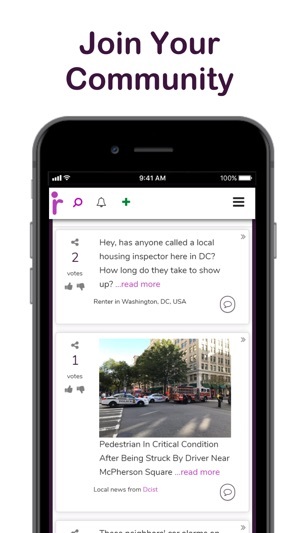 ► Just search for: "My roof is leaking", "My landlord is not returning my deposit", or "Leave a review"
► In thousands of cities in numerous countries, you’ll see neighborhood news in a social feed, keeping you connected to new restaurant openings, city townhalls, events, and changes to local laws. ► Safety is our #1 priority! Our advanced AI and user reporting system catch doxxing and other possible abuses of social media. ► The social guestbook is the best way to write and receive apartment reviews. ► Just search for: "Leave a review", "I have a crazy story", or "Tell me about local news"
► Enable free add-ons. 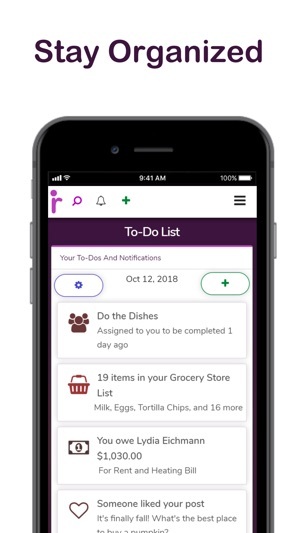 Manage your chores, shopping lists, or bills by simply enabling the appropriate add-on. ► Just search for: "Laundry", "Roommate is not doing the dishes", or "Plan my trip"
► Homeowners love us too! They use it primarily for just keeping track of their to-dos and bills. ► The RenterPeace smart assistant has the answer. Just type in any feature, question, or task and you’ll see the right tool. 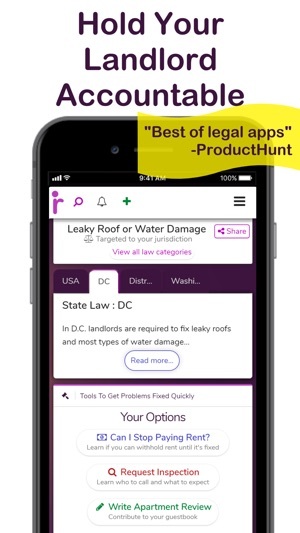 RenterPeace was selected as "Best of Legal Apps" by Product Hunt. While we are proud to present easy access to legal information, we are not a law firm. We do not offer Legal Advice, participate in any legal representation, or otherwise substitute for an informed analysis of how the law applies to the specific facts of your situation. RenterPeace is not a "lawyer referral service." Legal information is primarily only made available in the US, but we offer legal self-help tools that may be useful anywhere (e.g., document your problems or notify a landlord). Problem or question? Just type in "help" into the search bar and select the "Give Us Feedback" option or just email us at info@renterpeace.com. We respond very quickly. We love hearing from you and are very diligent about fixing any bugs or problems quickly. App notifications now working more consistently with newer iPhones and iPads. Great app, never had any problems. Way more convenient than calling. 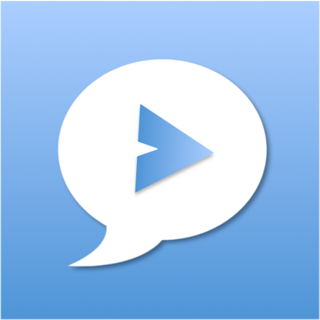 Easy to use app I always use it when I am sharing room. I used this app few times, and I think this is my favourite app, have nothing to complain and it works as the description. Feeling enjoyable when I use this app. The interface are great and friendly to me. It has fast efficient too.